As I waited on the Columbus Circle subway platform, a friend emailed me to recommend Fates and Furies, Lauren Groff’s 2015 novel. By the time the C train doors opened—really!—I was already reading the ebook for free on my smartphone with the SimplyE app. A little frisson of librarian glee ran through me. Anyone who has struggled with other ebook readers from libraries will understand my joy. Historically, apps like Overdrive and Adobe Digital Editions have been very user-unfriendly. (Even the ebook vendors that Lloyd Sealy Library works with make downloading ebooks for offline use very difficult, although reading online is a cinch.) But SimplyE simply works. SimplyE is free to download and is available for iOS and Android, and it requires a library card sign-in. If you have a New York Public Library (NYPL) or Brooklyn Public Library (BPL) card, you can access ebooks that are available through those library systems. 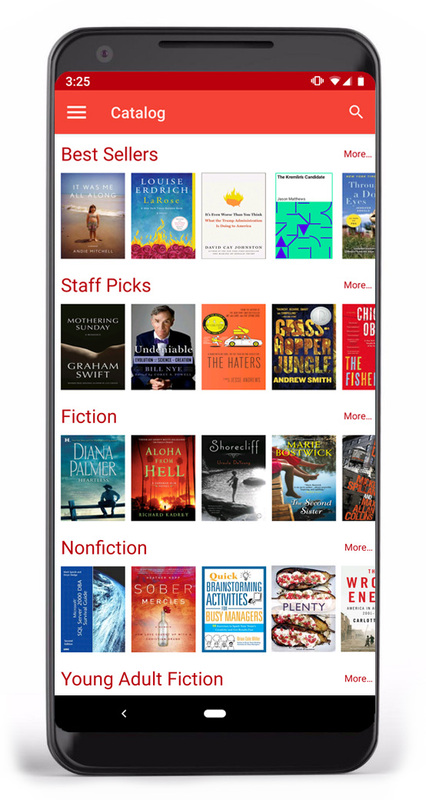 The app’s home screen displays current best sellers in fiction and non-fiction, staff picks of recent publications, young adult books, and books in Spanish, Russian, and Chinese. Just tap on a book cover to download or reserve it. I use the SimplyE app quite a lot on my Android phone. Browsing and searching work as expected, and it’s infrequent that a book I want to read isn’t in the catalog. What is frequent, however, are long queues for very popular books. (I am currently 635th in line to read Gillian Flynn’s Sharp Objects.) Just like print books, library ebooks are usually limited in number, so only a certain number of people can download it at a time. Don’t get disheartened, though—you can reserve a place in the queue for unavailable ebooks, and in the meantime, there are plenty of available ones. You can filter the catalog to display only currently downloadable books to avoid disappointment. Ebook downloads are very fast. The app allows you to read downloaded ebooks without network service, which can be a lifesaver when your subway train is delayed in a tunnel. There is one odd bug in the Android app that plagues me: when I change font size or page background color, the app takes me back to the first page in the chapter I’m reading—even if that means rewinding 200 pages. (As a programmer myself, I can appreciate the challenge of this seemingly simple function.) As it happens, this bug turns out to be a great incentive to finish a chapter before closing out of SimplyE. The app is designed and built by Library Simplified, a group of 10 public libraries with NYPL as the lead partner. The Library Simplified project is funded by the Institute of Museum and Library Services. “Through our collective action,” the Library Simplified website says, “libraries can better connect more people to more books[,] for we believe more people reading more is our ultimate mission. SimplyE is how we hope to connect more people to more books from libraries.”* Hear, hear! * Source: “About.” Library Simplified. Accessed 17 Oct. 2018. I would be remiss not to note that Lloyd Sealy Library also gives you online access to many ebooks. These are primarily academic publications that support the multidisciplinary research done on our campus. You can find ebooks through OneSearch, which displays a “Full text available” link instead of a call number for ebooks. Reading (or “streaming”) ebooks online is easy as pie, and downloading a chapter at a time as a PDF isn’t too hard, but downloading entire books for offline reading can be immensely onerous and confusing. That said, our ebook collections continue to grow and have proven to be very convenient for off-campus research.